The tour lasts approximately 8.5 hours. Included in the price is admission to the tour, as well as to the Top of the Rock Observatory, and admission to a 90 minute New York Harbor Sightseeing Cruise. 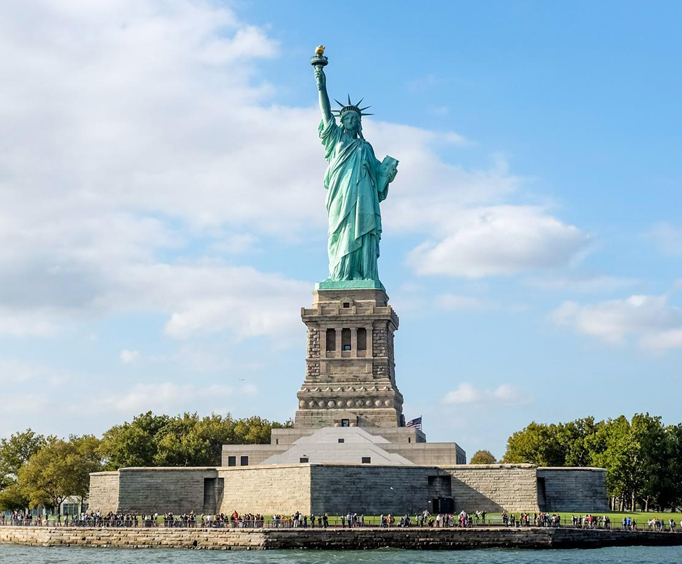 This Manhattan Experience Tour lasts 8.5 hours and enables guests to explore New York by land and sea as a harbor boat ride is included that grants photo opportunities of Ellis and Liberty Island. Efficient transportation and the navigational expertise of your tour route will ensure that you see as much of the city as possible during this day excursion. Bring a camera to capture views from atop the Top of the Rock Observatory and witness the skyline from a new perspective. If you're visiting Manhattan and are unsure of how you're going to fit all the attractions into your schedule, then this is a great opportunity because the Manhattan Comprehensive Tour has done the planning for you and will make sure that you experience all the city has to offer. This stop has so much to offer tourists, with seven magnificent museums that not only house beautiful art, but are works of art themselves. The architecture alone is impressive, boasting grandiose details. This is the perfect addition to any tour and will leave visitors in awe of everything it has. This neighborhood in New York became popularized in recent history with artists of all kinds using it for their lofts and galleries, because of it's low-rent buildings. Now popular for its shops and boutiques, it's home to multiple national and international chain store outlets. Containing numerous cast-iron buildings, it's also a New York City and National Historic Landmark, making it the perfect addition to any New York tour. Battery Park is perfectly situated where the Hudson River meets the East River and has great views of the New York Harbor. This park is home to numerous sculptures and memorials, making it a truly magnificent and beautiful park to see. It was named for the Dutch artillery battery that served to protect the settlement situated behind it. Rich with history and beauty, this park is a great addition to the Manhattan Experience. This spectacular cathedral is a brilliant combination of architectural styles, with Romanesque Revival, Byzantine Revival, and French, Spanish, and English Gothic Revival all having a claim on parts of the building. It is a magnificent sight to behold, which makes it a really enjoyable part of the Manhattan Experience Tour. Resting place of Civil War Commanding General, and 18 President of the United States of America and his beloved wife Julia, this tomb was erected and funded by the Grant Monument Association. The tomb is located in Riverside Park, which was close to the family's residence, which made it easy for the General's widow to visit his gravesite. The mausoleum houses a bookstore, memorabilia, restrooms, and a video of Grant's life. This is the ultimate memorial to the 18th president and a must-see stop on this tour. This stop is a marvelous memorial dedicated to the many lives lost in the 1993 bombing of the World Trade Center, and the September 2011 attacks on the Twin Towers. With the names of all the lost displayed on panels along the memorial, this is a wonderful tribute to those who were unfortunately killed in the two events. The 1993 bombing claimed the lives of 6 individuals, and the September 2001 attacks claimed the lives of 2,977. The memorial is a great way to pay respects and a great addition to the tour. The Brooklyn Bridge is a highly recognizable cable-stayed/suspension bridge in New York and was one of the oldest bridges of its kind in the US. This bridge connects Brooklyn to Manhattan via the East River and is used by up to 120,000 cars, 4,000 pedestrians, and 2,600 bicyclists daily. The bridge boasts impressive views of the city skyline, Statue of Liberty, and the East River. This place is a great place to see on your tour! See what your ancestors saw when first arriving in America at Ellis Island. This location served as the immigrant inspection station from 1892 to 1954. Now considered a U&period;S&period; National Monument, National Historic Place, and a New York City Landmark, it's filled with a rich and deep history based around people who've emigrated from all over the world. The island was also the subject of a rather heated debate on what state the property belongs to, whether it be New York or New Jersey, with the case eventually reaching the US Supreme Court. The Supreme Court ended up ruling that close to 80% of the island actually lays in New Jersey territory.This location is a terrific stop for any tour. This historic building has a rich backstory, with its original name having been the Fuller Building, after George A&period; Fuller, known as the "father of the skyscraper." The nickname "Flatiron Building" came about because of the building's strong resemblance to a cast-iron clothing iron, and the structure's official name was eventually changed to Flatiron Building. Built in 1902, and added to the National Register of Historic Landmarks in 1979, this building has so much to offer those who come to see it. This stunning neighborhood is located in Lower Manhattan's upper west side and is known as the artists' haven, Bohemian capital, and birthplace of the Beat counterculture movement. The Village has undergone wall-to-wall gentrification and restoration efforts, bringing it to having the status of one of the ten most expensive zip codes in the US. This is a marvelous neighborhood and is the perfect place to see the culture of New York. This neighborhood was once known for its large population of Italian-Americans and has been infamous for it's organized crime since the early 1900's. It has been featured in notable films and books such as the Godfather, and Mean Streets. With a rich Italian-American history, it now houses numerous cultural events. Once described as "the foul core of New York's slums" by notable social reformist and documentary photographer Jacob Riis, it has since seen vast restoration and gentrification to bring it to its current luster. Considered one of the most expensive and best shopping districts in the United States, this area is home to some of the most stylish and upscale shops and boutiques. You'll see places like Saks, Lord & Taylor, and more, as well as national historic landmarks like the Empire State Building, and the New York Public Library. This has been a popular shopping destination for locals and tourists alike. With an upwards of 40 million visitors per year, this is the most visited urban park in the United States, and one of the most filmed locations in the world. 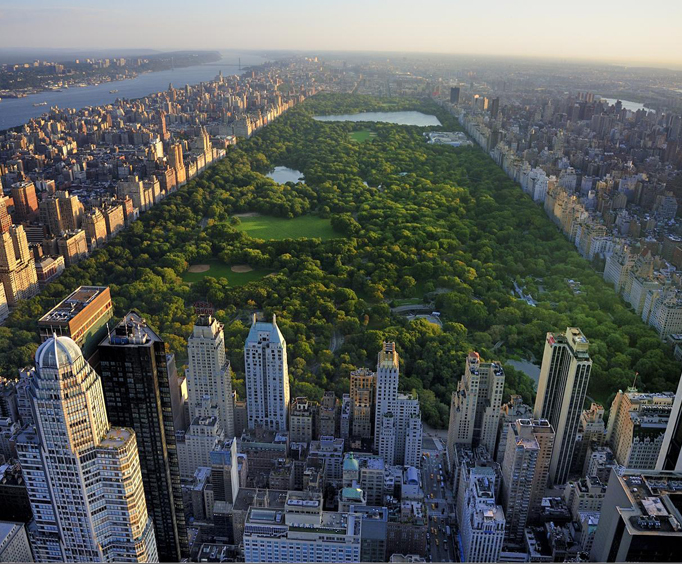 Established on 778 acres in 1857, it was expanded to a whopping 843 acres in 1873, Central Park houses a wide array of sculptures, memorials, man-made lakes, and even its own zoo, making it a popular destination for all kinds of people. This splendid park is a great addition to the Manhattan Experience Tour. The Statue of Liberty is one of the most notable locations in New York and the world, given to the United States by the French as a gift in 1886. This highly recognized statue is a robed woman meant to resemble the Roman Goddess Libertas and is etched with the Roman numerals JULY IV MDCCLXXVI (July 4, 1776), the date of U&period;S&period; Declaration of Independence. The statue is an icon of American freedom and is meant to welcome immigrants from all over. This large complex has 19 high-rise commercial buildings in it and covers 22 acres of land. The complex has been made famous by shows like 30 Rock, and the Today Show, and has a wide mix of Art Deco and Modern architecture styles. Notable places like Radio City Music Hall and the RCA building also call this massive complex home. The original construction began in 1930 and ran for a duration of 9 years. It was added to the National Register of Historic Places and declared a National Historic Landmark on December 28, 1987, and has been a destination for tourists for generations. Harlem has long been a neighborhood known for its population of African-Americans and was home to the Harlem Renaissance Movement, which saw the large influx of African-American works of art. Since the revival of New York in the latter part of the 20th century, Harlem has seen large amounts of restoration and gentrification, bringing in new wealth and culture. Home of the famed Apollo Theater, and numerous other famous landmarks, this is a great addition to the tour. The Empire State Building has long been a notable feature in New York. This skyscraper houses a staggering 102 floors and stands at an impressive 1,454 feet with its antenna. This building currently holds the rank of one of the tallest buildings in the US, coming in fifth only to One World Trade Center, Willis Tower, 432 Park Avenue, and Trump International Hotel and Tower. It's the 34th tallest in the world, making it's height even more staggering when put into that context. See the impressive structure for yourself on the tour. The Top of the Rock Observation Deck is situated on three floors at the height of 30 Rockefeller Plaza and is a terrific place to get one-of-a-kind, 360-degree views of New York. See the Manhattan skyline like never before at this wonderful spot, which has been popular for tourists and locals alike. This tour lasts approximately 6 hours and gives guests a quicker, yet still in-depth look at Manhattan. The tour includes sights like Times Square, Central Park, Harlem, and the Empire State Building. Guests are sure to have a blast! The Manhattan Experience Tour is sure to be a blast. This tour lasts approximately 8 hours and features an all-encompassing look at Manhattan. The tour includes a guided and narrated bus tour, a 1-hour cruise along the Statue of Liberty harbor, and a ticket to the Top of the Rock. 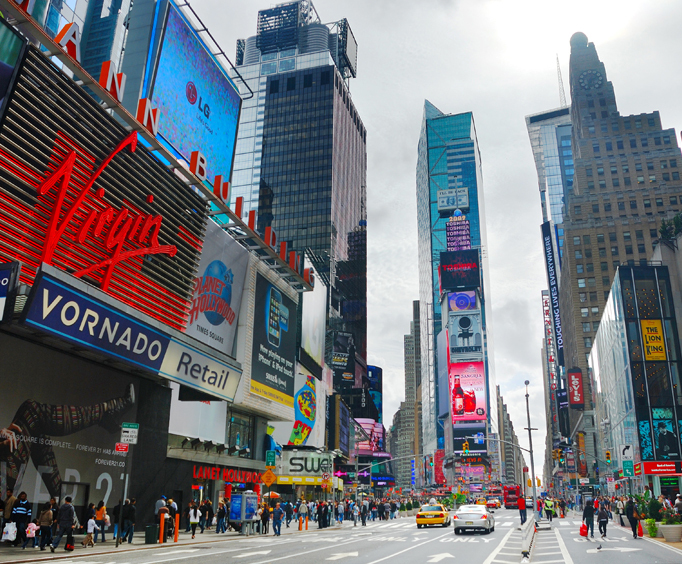 Guests will see places like Times Square, Central Park, and more. The tour was fantastic. We got to see see everything that manhattan has to offer. Our tour guide was also great. I would recommend this tour to everyone who doesn't have a long time to stay in ny.